Call Heath (205) 620-1818 Alabaster AL. Dirtworks and Bobcat Service constructed this retaining wall. We removed vegatation beneath the existing wall and hauled off the property. We excavated the footings for the wall, installed 4' drain on inside-bottom of wall. The wall is constructed from GeoStone material, it is 12' tall and 95' long. 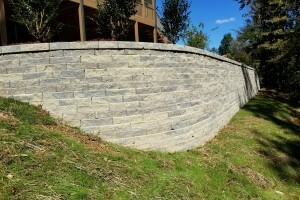 Dirtworks and Bobcat Service constructed the 105' long and 6' tall retaining wall in Alabaster, Al. 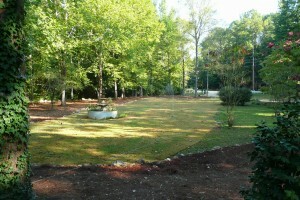 Commercial landscaping in Alabaster, Alabama. This commercial building in Alabaster, Alabama was newly constructed. Dirtworks and Bobcat Service came in and graded property - added top soil, installed irrigation system, added sod, plants, trees, ground cover. Our customer was really pleased with outcome, especially time and efficiency of our work. For any commercial landscaping needs. Call Heath (205) 620-1818! It was a pleasure to participate on the landscaping project in Alabaster, Al. We removed huge stumps, graded the yard and supplied material. The wedding ceremony was beautiful.